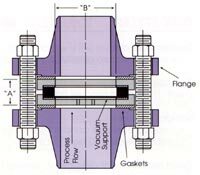 The REV™ type disk is suitable for applications where vacuum conditions exist and when the burst pressure is less than 22psig (1.52 bar). in. mm barg psig barg psig mm in. mm in. mm in. .